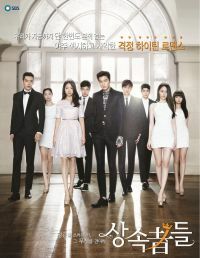 Also known as "The Inheritors" and "Those Who Want the Crown, Withstand the Weight of it - The Heirs"
A worthy successor to the international hit "Boys Over Flowers", Heirs follows a group of privileged, elite high school students as they are groomed to take over their families' business empires. These wealthy students seem to have everything under control–except their love lives. 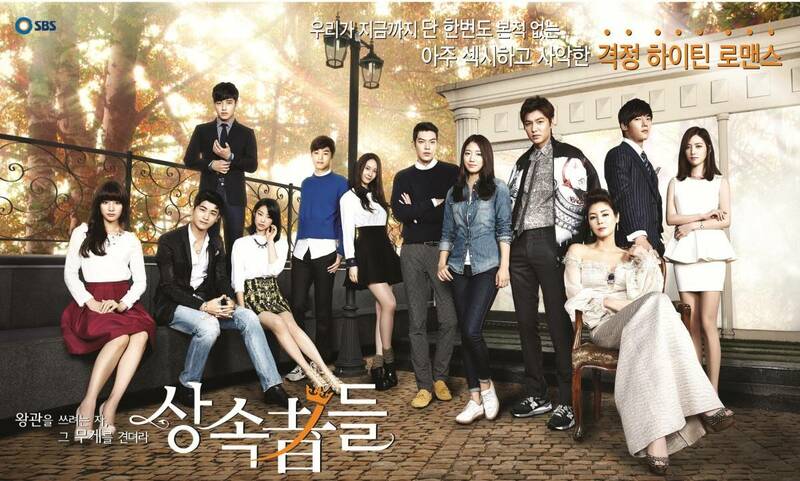 Kim Tan (Lee Min-ho) is heir to the Empire Group sent to study abroad in the U.S. In reality it's a form of exile, as his elder half-brother back home (Choi Jin-hyeok) schemes to takes over the family business. While in the States, Kim Tan bumps into Cha Eun-sung (Park Sin-hye), who's arrived from Korea in search of her older sister. He feels himself falling for her, never realizing that she's the daughter of his family's housekeeper. When his fiancée Rachel Yoo (Kim Ji-won-I) arrives to bring him back to Korea, his heart is torn between love and duty. Meanwhile, Rachel's half-brother Choi Young-do (Kim Woo-bin) develops his own crush on Eun Sung. Who said being a rich, beautiful high school student was easy? Kang Ji-hwan and Kim Ok-bin to star in OCN's "Children of a Small God"
Choi Jin-ho to star in tvN's "Mr. Sunshine"
Park Shin-hye sends coffee truck to Krystal in "Bride of the Water God 2017"
[Lily's Take] All the Cheesy Lines from "Descendants of the Sun", "Goblin", "The Heirs" etc. Can Goblin receive the five stars rating? "Goblin" Park Kyung-hye, "Pleased to be in it"
[HanCinema's Drama Review] "Tomorrow Boy"
"Descendants of the Sun" writer Kim Eun-sook's next work to be on tvN? "Please Come Back, Mister" VS "Descendants of the Sun"
Song Joong-ki and Song Hye-kyo in "Descendants of the Sun"
"Producers" and "Descendants of the Sun", will they reignite Hallyu? What's next for Kim Soo-hyun, Lee Min-ho, Kim Woo-bin and Lee Jong-suk? Lee Min-ho, "My target is to expand the number of male fans"
Hallyu's two face in China? Kim Sung-ryung to star in "Flower of the Equator"
Yoon Son-ha to star in "You're My Life"
Kim Woo-bin and Lee Hyun-woo's "Criminal Designer"
[Spoiler] "The Idle Mermaid" Nam Joo-hyuk and Kim Seul-gi parody "The Heirs"
Choi Jin-ho, enemies with Shin Sung-rok in "Liar Game"
Park Shin-hye to star in "Pinocchio"
Jo Yoon-woo in "Tomorrow's Cantabile"
"My Love from the Star" VS "The Heirs"
Lee Min-ho, "Date? Of course I want to"
Lee Min-ho has taken over China. He has been chosen as the most wanted for a Chinese TV show. The demand for the actor is overwhelming. According to mobile site Tencent, Lee Min-ho came up with 29% in votes. 130,864 people voted altogether. Second in place comes Lee Hong-ki from FT Island with a gap of roughly 100,000 voters##. 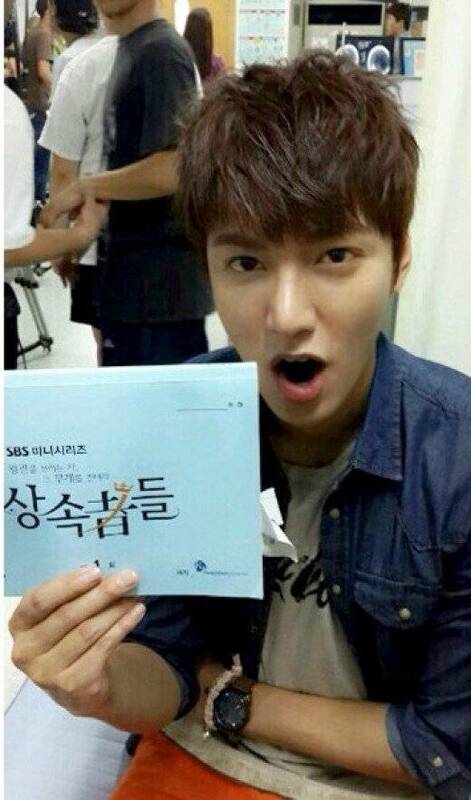 Chinese media analyzed Lee Min-ho as the driving force of Hallyu. If he lit China on fire with "City Hunter" in 2011, he created a syndrome with "The Heirs" in 2013. Lee Min-ho's popularity in China is indeed amazing. Mobile Messenger Line mini-drama "One Line Love" hit 20 million views and Chinese fans went crazy over 15 minute, 3-part advertisements. He might re-star in a TV program according to the result of this vote. He starred in it during January 2012 for a New Years' Special. He was the first Korean star to appear a full 90-minute in the program. Meanwhile, Lee Min-ho is focused on the movie "Gangnam Blues" which is based in the 1970s, about a struggle between political powers and dark powers of society. 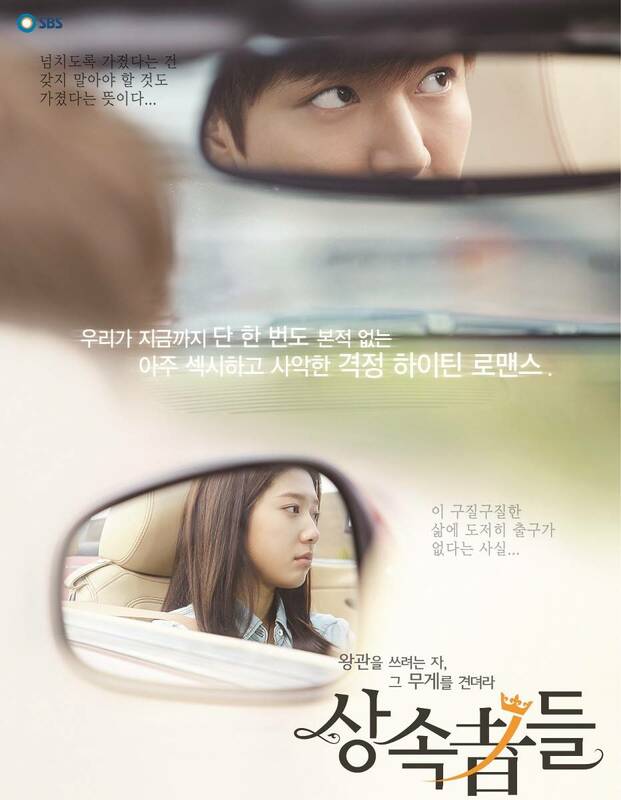 Lee Min-ho and Park Shin-hye, to cancel or not? Choi Jin-ho in "Gangnam Blues"
Park Hyung-sik, "Lee Min-ho and Kim Woo-bin are funny and playful"
Will Korean Soap Prompt China to Ease Censorship? Kim Ji-won in "Drama Special - Why I'm Getting Married"
Lim Ju-eun in "Empress Qi"
Kim Eun-sook, "The Heirs" writer chooses "Descendants of the Sun"
Kim Rae-won stars in Yoo Ha's "Gangnam Blues"
Lee Min-ho, Kim Woo-bin and Park Shin-hye, what next? Park Shin-hye, "Being Eun-sang for 4 months"
Kim Woo-bin "The Heirs", "Thanks for the love"
Park Shin-hye, "I shook so hard when I received the final script"
Lee Min-ho and Choi Jin-hyuk from "The Heirs"
Lee Min-ho, "The ending of the drama? I'm curious to find out"
"Secrets", will it continue accelerating? "The Heirs" catches up with "Secrets"
Which Choi Jin-hyuk is real? 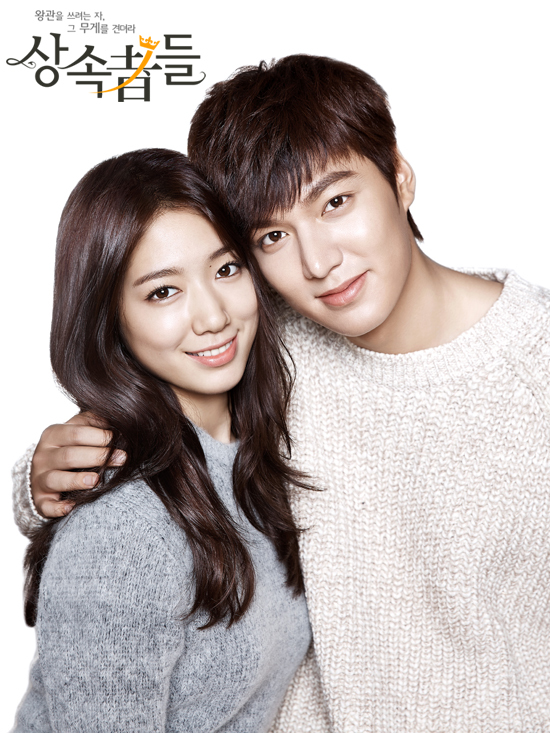 "The Heirs" pushed away by "Secrets"
Park Shin-hye, "I want to get married before thirty"
Added posters and new stills for the upcoming Korean drama "The Heirs"
Park Shin-hye in "The Heirs"
Lee Min-ho and Park Shin-hye in LA for "The Heirs"
Lee Min-ho in Yoo Ha's "Gangnam Blues"
Kim Ji-won in "The Heirs"
Kim Woo-bin in "The Heirs"
Lee Min-ho goes into first scene of "The Heirs"
Lee Min-ho and Park Shin-hye in "The Heirs"
Lim Ju-eun to star in "The Heirs"
Kim Ji-won joins "The Heirs"
Krystal to star in "The Heirs"
Yoon Son-ha to join "The Heirs"
Choi Jin-hyuk joins "Those Who Want the Crown, Withstand the Weight of it - The Heirs"
Upcoming Korean drama "Those who want the crown, withstand the weight of it - The Heirs"
View all 454 pictures for "The Heirs"
parks shin hye and all cast fighting!!!!! !